A community of women working together for deeper spiritual connections. Through our baptism, we have become living stones to be built into the spiritual house of the church. With this initiation into the church, we are called to be subject to each other and to serve each other. (CCC 1269). There are approximately 205 Catholic priests serving the nearly 1.8 Catholics within the Archdiocese for the Military Services at over 200 military installations around the world. As baptized faithful, we depend on our priests for sacramental support, shepherding, and leadership. We also recognize that as laity, we cooperate with our pastors in the servant leadership in the chapel community by putting our charisms and gifts into active practice in our chapels. (CCC 907). MCCW actively partners with chaplains and engages with women to teach and model best practices for lay leadership in military chapels. MCCW teaches the fundamentals of starting a women’s ministry group: making an invitation, developing a program calendar, working cooperatively with chapel staff, and building the bench to develop leaders. We also teach more nuanced leadership practices of building a diversely gifted team of lay leaders and resolving conflict mercifully. Spiritual Discernment is a holy process in which you evaluate your life through the eyes of our Lord. It really isn’t an end result but a journey that brings you to a position + holy purpose. This program is a spiritual exploration of prayerful preparation, lectio divina, being a father-daughter of the King, and developing strength of character and is ideally used in leader development, and for spiritual reflection. 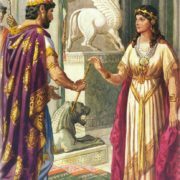 “Queen Esther – A Purpose Such as This” invites women to walk with Esther as she prepares to serve her king and save her people. The program is adaptable for use as a weekend-long spiritual retreat, leadership and team building exercise, or a day of reflection. Through experiential storytelling, engaging the senses, lectio divina, and catechesis in exploring the book of Esther and Scripture interpretation, women consider how they prepare to approach the King in their ministry roles, personal life, and the life of the chapel community. As a weekend retreat, this program ideally includes mass, rosary, reconciliation, and leader discernment for a chapel community using the principles of St. Ignatius. To invite MCCW to present this day of reflection, or to obtain materials to present your own day of reflection on Esther, contact admin@nullmccw.org. Through presentation, spiritual exercises, sharing, food, music, Mass, and fellowship, participants will consider the sacrament of Baptism, and “putting on Christ” for others through biblical hospitality, and practicing hospitality through in-reach and outreach. What does it mean to practice biblical hospitality? How do we give and receive hospitality in our walk with Christ, our Faith Communities, our families, and in the strangers we meet? This experiential day of reflection invites ladies to enter Lydia’s world. 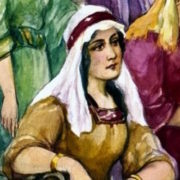 As the first convert to Christianity in Europe, Lydia was a pioneer of the Gospel, and her response to God was to offer hospitality to those who preached the Gospel. Through a day of presentation, spiritual exercise, sharing, music, food, and fellowship, we invite you to the world of Lydia of Philippi. During this day of reflection, communities will reconsider Baptism and “putting on Christ” for others. Participants will gain an understanding of hospitality and practices to implement “putting on Christ” in their faith communities. Based on the life and letters of Saint Teresa of Calcutta, this encounter is geared toward discipleship and leader development through participating in the life of the Church, mentoring in the Faith, and serving the least. Saint Teresa of Calcutta radiated joy. She loved abundantly and accomplished miraculous things in her life for the sake of bringing souls to Jesus. She served the poor and fed the hungry. 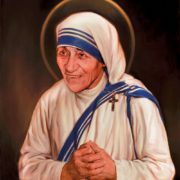 She is known for doing little things with great love, but in serving God through every little thing, she garnered the attention of the world, won influence over leaders, and was even given a Nobel Peace Prize. What she knew is that the adulation and accolades and attention were not what she sought. She sought to serve and to bring the joy of Jesus to everyone she encountered with an urgency that created such momentum that the Holy Spirit moved mountains through her. The focus of this presentation is building and sustaining that JOYFUL MOMENTUM on a leadership board, and in your women’s ministry community. 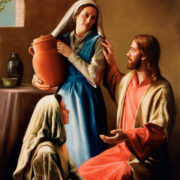 This leadership training presentation incorporates the life and letters of Mother Teresa with practical and step-by-step guides for serving in a leadership position and working with a board, with emphasis on staying grounded in the Sacraments, building a relationship with the priest and chapel staff, resolving conflict, planning programs, and effectively in-reaching and out-reaching to serve Jesus and sustain the Joy of the Gospel. This six-part book study using Sherry Weddell’s Forming Intentional Disciples will help your Catholic community answer the question – “How can we transmit a living, personal Catholic faith to future generations?” The answer is, of course, by coming to know Jesus Christ, and following him as his disciples. But to be disciples, Catholics-in-the-pew must make a conscious choice to know and follow Jesus before they can draw others to him. This work of discipleship lies at the heart of this book, which is designed to help Church leaders, parish staff and all Catholics transform parish life from within by taking action! Through this study, your community will learn about the thresholds of conversion, how to open a conversation about faith and belief, how to ask thought-provoking questions and establish an atmosphere of trust, when to tell the Great Story of Jesus, how to help someone respond to God’s call to intentional discipleship, and much more. Be prepared for conversion because when life at the parish level changes, the life of the whole Church will change.